John Kadlecik of Furthur & Dark Star Orchestra at ONE-2-ONE BAR on Sunday, February 24th! Support from Grace Rowland Park of The Deer! This show sold out last year so don't sleep on tickets! 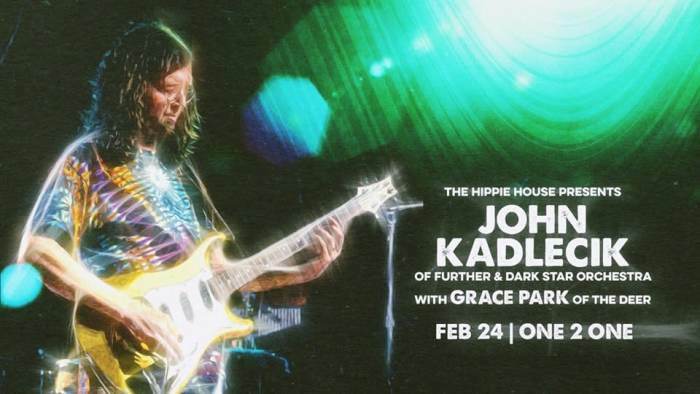 John Kadlecik is a singer, songwriter, and musician based in the DC-area who can play most string instruments, but is primarily known for being a guitar-slinging sideman to Grateful Dead members Phil Lesh and Bob Weir in the band Furthur. An original co-founder of the group Dark Star Orchestra, John has been performing improvisationally-oriented shows regularly since the late 1980's and touring nationally for the last 20 years. His work also includes several studio releases of original music, and he is currently active with his own group, The John Kadlecik Band, as well as "supergroup" the Golden Gate Wingmen and occasionally Phil Lesh & Friends. Grace Rowland Park is frontwoman for Austin psych-folk band The Deer. She's performed with Elephant Revival, Good Field, and Alejandro Escovedo, and recorded/performed with MilkDrive, Abram Shook, and Sixo. In recent years she was nominated for an Austin Music Award for Best Female Vocalist, and two Austin Music Industry Awards for Best Album Art. Also an avid graphic artist, she works in cut paper, stained glass, and multimedia design.